A large main compartment, roomy front pocket, and zippered slip pocket furnish ample room for schoolbooks and other supplies. The Campus Mate is manufactured using super tough CorduraTM nylon fabric with extra heavy duty stitching. Full three-sided zippers allow easy access to the primary and secondary storage spaces. Weather flaps cover the main zippers to insure items inside stay dry. 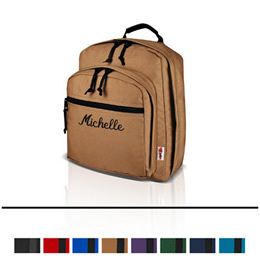 Shoulder straps feature half inch padded foam for extra comfort. This compact, versatile pack is a favorite from elementary school up.